MY attention has been drawn to the other side of the Atlantic, where Canada’s Toronto Star recently welcomed an eminent visitor. “Touring the province this month is a 67-year-old man who looks like Santa Claus and speaks with a strong Yorkshire accent,” it pronounced. The identity of the bearded tourist – giving a series of talks and lectures on the consequences of privatising health provision may come as a surprise to readers. Dobbo has been giving the Canadians some stern warnings about private health providers in Britain cherry-picking simple operations on healthy patients and leaving expensive dirty work to the NHS, while admin costs soar. “It’s so unpopular that we’ve got the bizarre situation where we have no fewer than eight ministers in the government that have actually joined the protesters outside their local hospitals to protest the cost of services,” he told the Kingston Whig-Standard in Ontario, where a lobby group has sponsored his trip during a debate over the future of the province’s medicare system. Who better to ask? 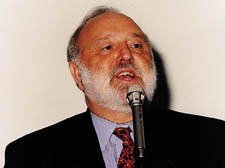 Frank Dobson was health secretary in the first Blair government, 1997-1999, and the man who introduced the fairly successful NHS Direct. HAVE come across successful publishers before but had never met one who, on the side, could earn thousands of pounds selling timber! But as I listened the other week to that 80-year-old mercurial publisher, writer and poet John Calder meander over his life, in a talk at his bookshop in Waterloo, I realised John is a firework of gifts. He related how he supplemented his poorly paid business as a publisher by selling timber. “I think it was about 1955 when I made £50,000 commission in timber,” he chuckled. “The meal started at 8pm, and after Burroughs and Beckett had had a bit to drink, I went off with Beckett, played table-tennis in the early hours, and we talked until eight the next morning,” he recalled. Once, he persuaded leading French avant-garde writers, such as Margaret Duras, to front a literary conference in Edinburgh. IT was typical of Bill Budd, who died recently, that he understood immediately why his old trade union friends pulled a face when he offered them a glass of white wine in the mayor’s parlour. “We can’t drink that stuff,” one of them groaned. “Never mind, come back next week,” replied Bill who had just become Camden’s mayor. And next week he was true to his word – there in the parlour was a big barrel of beer! As I was leaving the chapel at the crematorium in Bedford on Thursday, big Vic Heath, a former trade union leader at the Town Hall, regaled me with this story of Bill the man with a sense of humour. Stories abound of Bill’s days as an active unionist, especially during his time in the 60s and 70s as a shop steward in the post office where he often collaborated with Tony Clarke, then a postman, now Lord Tony Clarke of Hampstead. Old fashioned and decidedly not PC, Bill, once as a mayor, after he had made an award to a woman member of the staff, said: “Go on, girl give me a kiss!” He meant a peck on the cheek. But it was too much for the beetroot red woman who told him off. Out of his time he may have become, but Bill, who made his heroic mark during the war as a ‘tankie’ belongs to a generation to whom we owe so much. At the funeral I was struck by the different types of people who had been drawn to Bill – ex-Labour councillor Gerry Harrison and old unionists like Heath and Ian McDeson, I would expect, but also there to remember him was the former Tory councillor Johnny Bucknell and John Cohen, the former Deputy Lieutenant of Camden. After paying my respects to Bill’s widow, Iris, who had been his mainstay in all their decades of married life, I was approached by Rose Harte, a campaigner to save the borough’s libraries when they were under threat in the 90s. With Bill’s help the threat was seen off – and Rose suggested a fitting way to mark his efforts was to rename Chalk Farm library after him. What a good idea! HERE is a novel way to relieve stress – sing it out of your system in a choir. According to Andrew Miller, a leading figure in the Royal Free hospital choir, singing is a good way to reduce stress. Chatting to him during the interval of a concert at St Mark’s Church in Primrose Hill, just before Easter, he told me that the choir is mainly made up of doctors, lawyers and teachers – and they all find singing cuts stress. It was a wonderful evening with the orchestra beautifully delivering Tchaikovsky’s popular fifth symphony, followed by a moving rendition of Gounod’s St Cecilia Mass. But before the Mass, the choir dedicated a song to Helen Annis, a member of the choir who died in December. Helen was a respected psychiatrist at the Free, and although she was Jewish, would sing with gusto the choir’s Christian programme – masses, requiems. In her memory the choir sang the Kol Nidre, the Jewish lament for the dead. It was a lovely, moving moment in honour of a greatly missed member of the choir. THERE are two ways to confront health secretary Patricia Hewitt and Tony Blair who are throwing thousands of doctors – many of whom have been in medicine, as students and junior trainees, for nearly ten years – on the dole. Can you blame him? How would you feel if you faced the sack after dedicating your life to a career that is cherished throughout the rest of the world? Hewitt has retreated in the face of waves of anger from doctors and “revised” the recruitment system but many medics, including scores of senior consultants, have called for its abolition and revival of the old trusted system. Now, a large group of doctors are planning to test Hewitt’s action in the High Court with an application for a judicial review. I hear money has begun to flood in for the contest.